HomeTravelHe Knows the Stars’ Dirty Laundry. Because He Washes It. January 22, 2019 Travel Comments Off on He Knows the Stars’ Dirty Laundry. Because He Washes It. The world’s top specialist for tour laundry, Topf has traveled with many of the world’s biggest music acts, including Madonna, Pink and Beyoncé. As tours have become bigger and more professionalized, their logistics have become increasingly daunting. The U2 tour, which lasted about seven months and spanned two continents, included approximately 150 people, all of whom needed food, housing and clean clothes. In the early 2000s, Berry said, a “little man” — Topf — began appearing outside German venues with a van, offering to pick up, wash and return the production’s clothes. Berry said that the items were returned “pristine and folded.” Soon after that, he invited Topf to join him on tour. A few weeks after the U2 concert, Topf, who has a slight paunch and wears metal-rimmed glasses, was in the basement at the Max-Schmeling-Halle, another venue in Berlin, helping his son Achim, 31, do laundry for Die Fantastischen Vier, a popular German rap act. The biggest challenge of doing tour laundry, Topf explained, was the volume, which can vary unpredictably, and the need to work without fixed facilities. He often had to work outside or wherever he could find running water, he said, including, at one point, in empty holding cells intended for disorderly fans in a South African stadium. “I know every disabled bathroom in every German football stadium,” he said. When he is on tour, Topf begins almost every day by washing the performers’ clothes, which usually have to be air-dried with a small fan. The most soiled garments he ever handled, he said, were coveralls worn by the metal band Slipknot that had been sprayed with beer, cream and fake blood, and left in garbage bags for three days. Washing artists’ clothing involves high stakes. Topf recalled one incident, in which Joe Cocker grew furious after a discolored line appeared in pants that Topf had washed. “I haven’t forgotten that my whole life,” he said. When on tour, he often spends three to four hours every afternoon ironing the performers’ clothing, his least favorite part of the job, while simultaneously washing the crew’s garments. On some tours, he spends up to 20 hours a day doing laundry, he said. After a show, the machines go into specially built rolling cases, so they can be loaded onto trucks and brought to the next location. 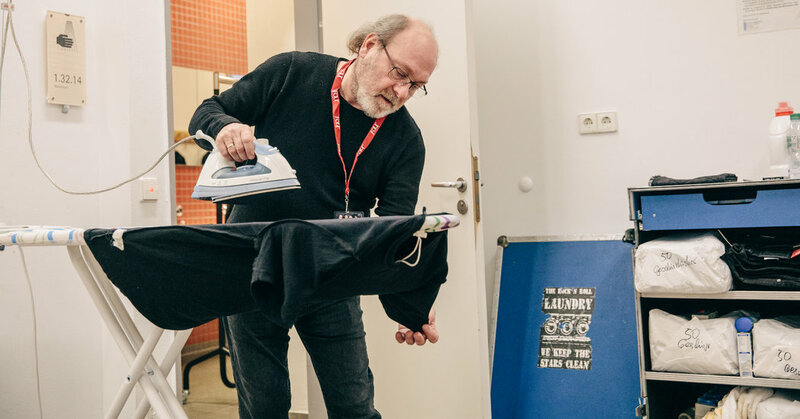 Joe Pomponio, a stage manager for numerous festivals in Europe who has worked frequently with Topf, said by phone that, for many acts that have spent years on the road, comforts like professionally done laundry have become vital. He added that he did not know anybody who offered services comparable to Topf’s, and that Rock ’n’ Roll Laundry was a fixture on the European festival circuit. “Der Topf is everywhere,” he said. Topf was born in 1956 to a family of East German refugees. In the communist G.D.R., his father worked as a smuggler, secreting people across the Iron Curtain in potato shipments. After he was caught by the East German secret police, Topf’s father escaped with his wife to Ludwigshafen, then in West Germany, where they founded a laundry. Topf is still based there. One evening in 1982, while making a delivery for his parents’ business, Topf noticed Ted Nugent’s tour bus, seemingly lost. After giving the driver directions, he was given free tickets to the concert, and later that evening, offered to clean the band’s clothes. When Nugent’s manager encouraged him to continue his services, he began standing outside concert venues “like a groupie” and offering same-day laundry services to visiting music acts, including Elton John and Blue Öyster Cult. He eventually bought a small truck, loaded in two washers and two dryers, and drove alongside touring bands. At night, he would sleep on top of his machines, doing laundry during the day for the Bee Gees, among others. Today, Topf’s business makes much of its income by renting out machines to touring productions, and it recently partnered with a businessman who has started an American version of Rock ’n’ Roll Laundry. Topf also runs a laundry business in Ludwigshafen catering to businesses and restaurants.